Lamb markets seem to have found some sort of level where buyers and sellers are happy, with prices largely steady this week in the east. In the West the lambs were the most expensive in the country. Supply was back this week on the east coast, as the public holiday in Victoria impacted numbers. 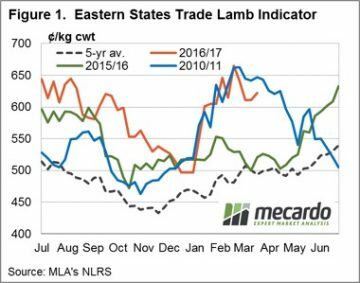 It was in NSW and SA where prices rallied however, with their respective trade lamb indicators gaining 10 and 17¢ to 622 (NSW) and 576¢/kg cwt (SA). 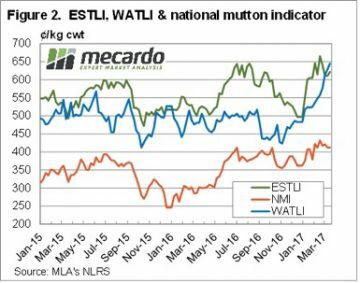 This lifted the Eastern States Trade Lamb Indicator (ESTLI) to 622¢/kg cwt, a three week high. Figure 1 shows that it has deviated slightly from the trend seen in 2011, but still remains very strong. Lamb producers are basically getting $20-25/head more for their lambs this year than last year, which is a pretty good result. Figure 2 shows the stellar rise of lamb prices in WA, as they move to a premium to the ESTLI for the first time in 15 months. Lamb prices in WA have rallied for four and a half months, and added 200¢, or 44%. This weeks 16¢ rise to 645¢/kg cwt was in spite of a 40% increase in yardings. The lift in yardings might be due to over the hooks quotes running almost 100¢ behind the saleyards. Mutton values remain strong, with Victoria having an average price of 443¢/kg cwt this week, the highest in the country. In the west mutton is slightly behind, having fallen 46¢ to 438¢/kg cwt this week. 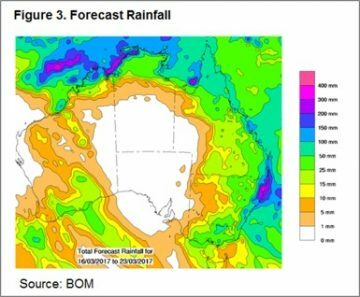 The rain forecast in figure 3 should see solid support for lamb and sheep prices over the coming weeks. It will encourage holding lambs, and sheep as it looks like an autumn break for at least some parts of the country. Downside is likely limited in the short term, unless there is a backlog of lambs about to hit the market. It’s hard to imagine they’ve been held this long with prices at these levels.